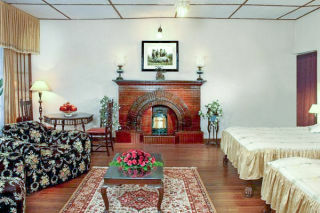 Our property is one of the oldest buildings in the hill station of Mussoorie. Originally a part of the Christ Church complex, it was built in 1836 by Captain Rennie Tailour of the Bengal Engineers. 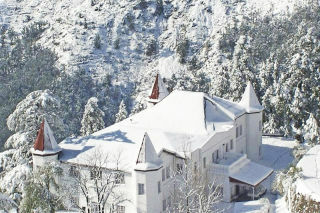 This stately mansion architected in Anglo-French style has served as a sanatorium for the British armed forces and then as a school (one of the first in Mussoorie), before finally becoming the summer retreat of the Kasmanda Royal Family. While it has remained with this family, it is now being run as a Heritage vacation rental. 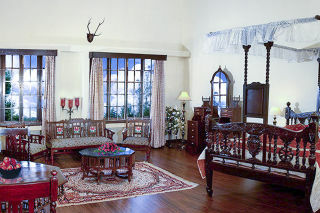 The grandeur and stateliness of this Palace is only matched by its spectacular setting. Situated 200 metres uphill from the Mall, it has a magnificent view both of the town of Mussoorie as well as the Doon Valley, and is strategically placed in a sprawling estate of three acres of pine forest, terraced gardens, and green lawns. The façade is a rather attractive one, as if it has come alive from a children’s sotrybok,with its conical-roofs and tall colonnades that shelter an arched doorway at the porch. 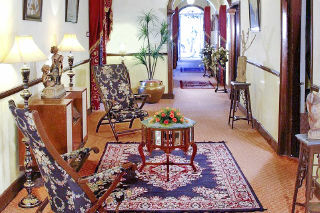 A grand carpeted staircase leads up from the foyer, with tall floor lamps and carved pillars that sit in greeting, while a marble-topped table with jaali work legs sits centre-stage. The room on offer here has old-world accents, with the hardwood flooring adding warmth. The bed is comfortable and a couple of antique carved chairs with hand-painted tiles and accompanied by a coffee table sit by the window, while a tall floor lamp placed strategically in between the two chairs makes this the perfect spot to read! 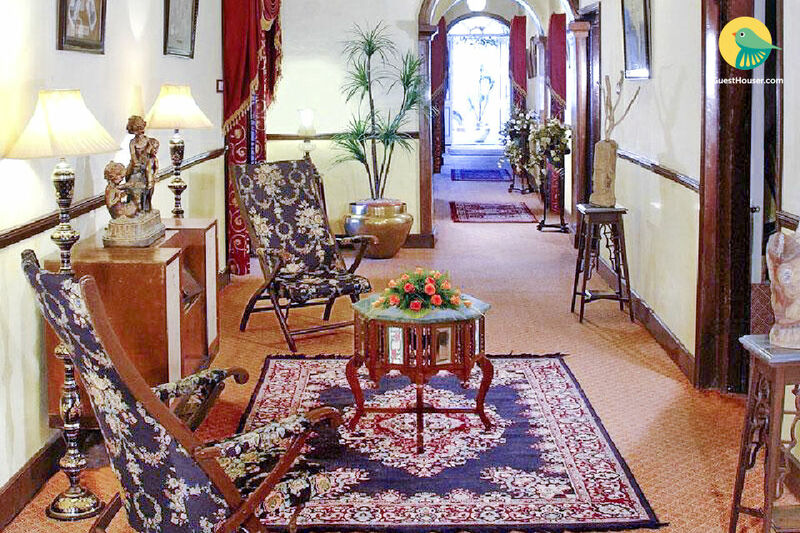 Our property has an old world charm in its ambience with a blend of modern luxury giving an ideal retreat from the hustle bustle of the city lives. 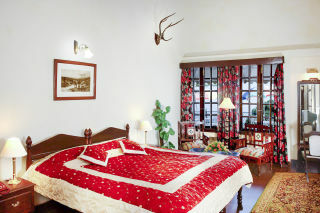 It is one of the best boutique hotels in Mussoorie. 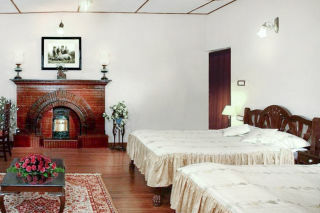 It has 23 exquisite rooms all well equipped with modern amenities giving a blend of modern day facilities with old world charm. The guests are served in an in-house restaurant and a garden restaurant delighting the taste buds with delicious Indian, Chinese, Continental and Regional Cuisine. Excursions : Kempty Falls (15 km) Tourists throng here for a dip in the pool at the foot of the falls. Steps lead down to the pool around which stalls ply tea, towels and bathing suits. Jharipani Falls (8 km) Bhatta Falls (7 km), Mossey Falls (7 km) Mussoorie Lake (6 km) - all popular picnic spots. The last also has boating facilities. Nag Devta Temple (6 km) Ancient temple dedicated to the Snake God. Jwalaji Temple Surrounded by dense forests, this temple on top of the Benog Hill is dedicated to goddess Durga The Yamuna bridge (27 km) This is a good angling spot but prior permits for fishing must be obtained easily from the Divisional Forest Officer in Mussoorie. Dhanaulti (25 km) Surrounded by fragrant pine and deodar forests, this secluded resort is far removed from the bustle of Mussoorie. 8 kms from Dhanauti is the shrine of Surkhanda Devi at a height of 8,000 feet. While it can be approached by car up to Kaddu Khal, the last two-kilometre stretch has to done on foot. Indira Gandhi International Airport, situated in New Delhi, is 280 km from the town of Mussoorie. The Jolly Grant National Airport in the Dun Valley is at a distance of 55 km. There are services from Dehradun, as well as Delhi, Saharanpur, Haridwar, Shimla, Chamba and Tehri.